Senior editor Keith Schneider wonders if maybe a spokesperson and Xbox games are needed. Every human being on the planet is dependent daily on drinking, bathing, cooking, and interacting with water. While children bathe in Manila, capital of the Philippines, two global water narratives are converging in a race that pits momentous calamity against the heroism of human recognition and ingenuity. Click image to enlarge. From east to west, ever since the world began, there was water. Plentiful. Clean. Always available. None of those descriptions apply to water today. Though the condition of the world’s water is perilous — and job-producing opportunities for conservation and efficiency are abundant — water’s ranking on the list of public priorities and attention typically is not near the top. It’s not for a lack of effort from the water wonks. In 1993, a year after international leaders met at the Earth Summit in Rio de Janeiro, the United Nations took a step to raise awareness of water’s place at the center of life by establishing World Water Day. The annual event — held March 22, and now in its 23rd year — comes on Sunday. The United Nations, a big unwieldy institution, has fostered a bit more heed to the day’s activities. It breaks up the immense world of water into more approachable streams flanked by a shoreline of optimism. World Water Day’s annual themes, as a result, are a catalog of earnestness and hope. In years past, World Water Day focused on women and water (1994), thirsty cities (1996), health (2001), disasters (2004), supply (2007), pollution and sanitation (2008), food security (2012), and energy (2014). This year’s theme — in recognition of the global debate about economic growth, ecosystem protection, and poverty reduction — is sustainable development. Good stuff. Necessary to talk about. But not fit for stirring widespread attention on Facebook, or going viral on YouTube. This is, after all, an era of short attention spans and fixation on inconsequential agitation or the absurd. The world’s residents, capable as they are, don’t like serious. They like to be amused. Shrinking from challenges is a global phenomenon. That’s as true in China as it is in India or Peru or the United States. 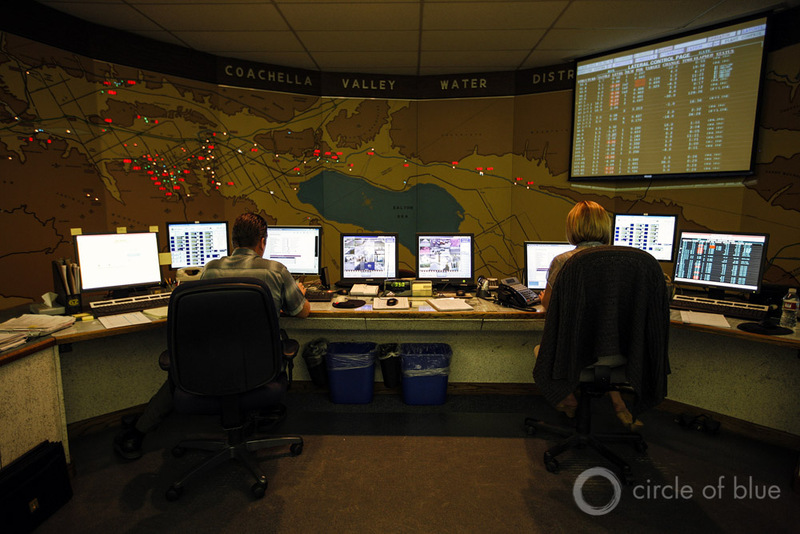 The control room inside California’s Coachella Valley Water District Administration Center is a hub of automated transport for water supplies that are steadily shrinking in the face of the state’s worst drought ever. Click image to enlarge. With public attention diverted by the French president’s paramours or Angelina Jolie’s marriage, the consequential work of engaging tough and abstract problems like water supply and water quality falls to whom? Global legislators imprisoned by partisanship and ideology? Agency engineers and regulators suffering with thin budgets? It might be that water needs a great spokesperson. Until the last 150 years or so, water didn’t need its own spokesperson, like the way Michael Jordan sells Gatorade. Where is the Katy Perry of water? For that matter, where is the Archbishop Tutu of water? Water certainly needs a more magnetic personality than Matt Damon, whose effort to highlight global sanitation and health is far less emphatic than his work as Jason Bourne. Water needs to form its own economy and consumer constituency, like the way Walmart influences the global retail supply chain, the National Football League dominates American television, and heads of state rule international news media. Coca-Cola, Budweiser, and Perrier need to be all about adequate supplies of clean water. In a century of stupendous water risk and hard-earned reward, water also needs an annual global summit, like those that occur around climate change, energy supply, economic strategy, and diplomacy. Municipal governments and taxpayers across the world are not anxious to invest in water infrastructure to supply running water or sanitation. As a result, entire sections of the world’s cities do without. Water trucks dispense, at nominal or no charge, the essential resource that makes it possible for the world’s biggest cities — nearly all of them now in Africa, Latin America, and Asia — to keep expanding. 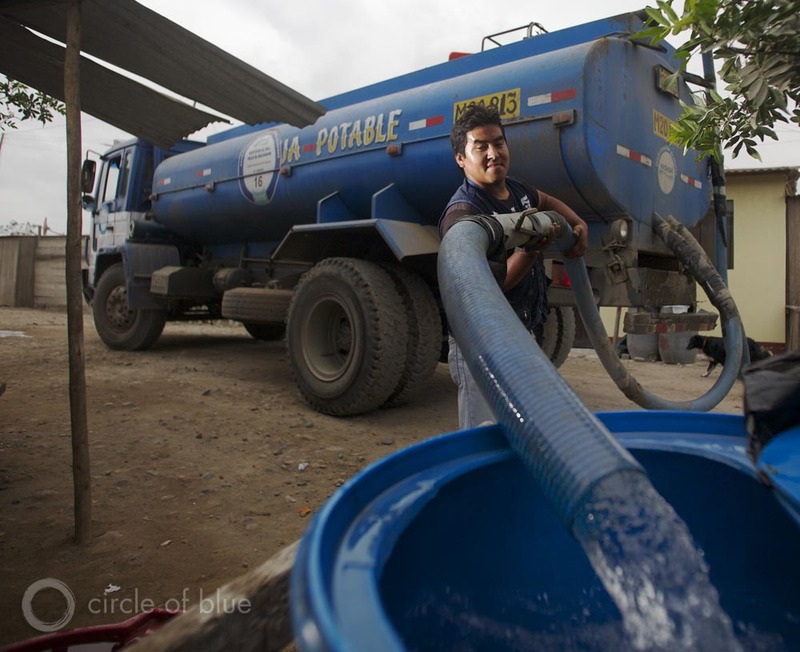 Here, a water truck supplies water to neighborhoods in Lima, Peru. Click image to enlarge. What suffices is sub-summit gatherings. Every three years, the World Water Council, based in Marseilles, France, holds the World Water Forum, which the council says is the largest international gathering of people interested in water. The seventh forum is scheduled to be held next month in Daegu-Gyeongbuk, Republic of Korea. Every year since 1991, the Stockholm International Water Institute organizes World Water Week in Sweden, a six-day gathering that mixes science, diplomacy, and advocacy for a global audience of 270 organizations and over 3,000 participants. The 25th World Water Week occurs in August. How about a hip institution to represent water? Because every human being on the planet is dependent daily on drinking, bathing, cooking, and interacting with water, we need something like the Louvre in Paris or Xbox identified with water. Make no mistake. Water merits all that focused attention. It’s a tremendous story of danger and redemption. Two global water narratives are converging in a race that pits momentous calamity against the heroism of human recognition and ingenuity. Neither story is fiction. The world right now is drowning in water risks: floods, droughts, contamination, disease, dead seas, and shortages. Each threat has been with us a long time. The glaciers that supply water to Urumqi, in China’s far desert west, are receding. Water levels are dropping in the handful of major canals that supply the city’s 3 million residents, prompting increasingly long periods of industrial plant shutdowns and water rationing. Click image to enlarge. In India, a Himalayan flood two years ago — the deadliest ever recorded — killed 30,000 people and wrecked Uttarakhand’s hydropower sector. In the United States, withering droughts — the worst ever measured in Texas and California — grip the two largest states, both major food producers. Entrepreneurs and a select group of governments respond with economy-strengthening and water-conserving equipment and practices. 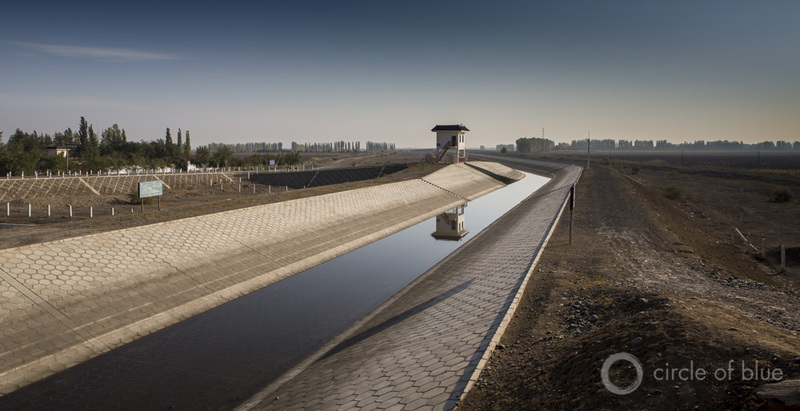 Beijing, one of the world’s driest cities, builds a network of wastewater recycling plants and requires developers to install water-saving plumbing in new buildings. Australia, wracked by a 12-year-drought in its prime food-growing region, rebuilds its leaky irrigation networks, hardening the bottoms of water-transport canals and installing digital gates to deliver much more precise quantities of water to farm fields. Other useful trends are occurring in diplomatic forums, where water supply is rising as a priority in international agreements. Last November, for instance, the United States and China reached agreement to reduce emissions of climate-changing pollution. Two of the six provisions of the pact focused on the links between water supply and energy production. In January, the World Economic Forum — a gathering of the world’s financial and political elite — ranked water crises as the top global risk for 2015. Improving access to clean water, limiting water pollution, managing ecosystem security, and reducing conflict over rivers that flow through multiple countries rank high as signal priorities in the new United Nations Sustainable Development Goals, which are set to take effect in December. For the time being, the big water story has no clear ending, though one could take shape more quickly than anyone anticipates. Until the start of the 21st century, people grew accustomed to weighty economic, social, and ecological changes that occurred at slow speeds, typically a generation or two. The nature of change and momentum differs substantially in the 21st century. In the United States, withering droughts — the worst ever measured in Texas and California — grip the two largest states, both major food producers. Thousands of acres of cropland in California’s Central Valley are being retired because of shortages of water for irrigation. Click image to enlarge. In U.S. sports, for example, the consequences of head injuries in football were laughed off for decades. But once the trickle of attention to football-related brain disease became a flood of true tales about brain injury and player suicide, the entire apparatus of college and professional football began to shake. The change in views about the threat of playing football took just a few years. Parents now discourage their sons from participating. It’s the new norm. The world’s relationship with water is in a similar pattern of adjustment. The episodic environmental or municipal insult — a reservoir drained of drinking water, a crop ruined by flood or drought, a broken water main — draws attention and quick response. The new energy-efficient pumps, the water-saving solar and wind generators, the pollution-cleaning membranes make us hopeful. The rapid changes, however — the power and number of deep droughts, the more violent floods, the serious contamination events, and the shortages — charge ahead faster than the equipment and practices to tame them. The momentum for a dreadful shift in the condition of water and its effects on the human community is building. World Water Day needs to reflect that urgency. There is time in this momentous race, but not much. The world’s great opportunity is to halt pollution, invest in conservation, and build markets for equipment and procedures that introduce an era of reason about the risks to water. Said another way, the nations of the world need to do whatever is necessary to secure the world’s water supply and prevent a calamitous new norm. What do you think about water in the 21st century? What (or who) is needed to make a real impact? I’d love to hear from you. Contact Keith Schneider directly or send a tweet to @modeshift. Aubrey, I completely agree with your question/concern about how many of the celebrities that have lent their voice to World Water Day will continue to support in the critical 11 months that follow. As Keith points out, the issues surrounding water and our collective future are enormous, and deserve far greater, broader, and more sustained attention than they are receiving. While World Water Day is a start in terms of raising public awareness, it cannot be the end game. Much like boiling down the African-American experience in the U.S. to “Black History Month,” water awareness cannot afford to be boiled down to just one day in mid-March every year. Water is a tricky, nuanced issue, and everyone in the global water community needs to put some serious thought into how we communicate with the public at large to make people appreciate the severity and urgency of global water issues. One tactic might be to fight fire with fire. If folks surfing the Internet are obsessed with kittens and zombies for whatever reasons, there might be some potential to produce water-themed viral videos that use kittens, zombies, or other bizarre Internet fixations to both educate and entertain at the same time. Even if that is a terrible idea, it is on all of us to think up innovative ways to communicate the importance of water in a way that moves beyond the status quo. We have a climate change rock opera focused on water. Adapting for the stage now.